Joe Root hit a superb 113 as England beat India by 41 runs in the fifth one-day international at Headingley. Three heavy defeats meant England had already lost the series, with one match washed out, but Root's highest ODI score laid the foundations for victory. He shared crucial partnerships with Alastair Cook (46) and Jos Buttler (49) as England posted 294-7. Ben Stokes, who hit 33 off 23 balls, then took three wickets as India were bowled out well short on 253. "I'm frustrated watching England in one-day cricket as they've got so much talent - they won't be favourites in Australia but they do have a chance of causing a shock or two, like they did in 2010 when they won the World T20 after no-one gave them a prayer. But they've got to give themselves a chance by picking the right players. The likes of Buttler, Morgan and Root have got the talent - you want to see those sorts of shots earlier in an innings from England." Some lusty late blows from Ravindra Jadeja (87 off 68 balls) narrowed the margin of defeat, but the tourists paid the price for losing wickets at crucial times. They lacked a player to hold their middle order together and anchor their run-chase, a role Root performed expertly for England. The 23-year-old Yorkshireman's masterful knock on his home ground eclipsed his previous 50-over best of 107, scored against West Indies in Antigua in March. Coming in with England tottering at 39-2, he helped steady the innings with skipper Cook, then slowly laid the platform with Buttler, before exploding into life during the batting powerplay. After beginning his innings in characteristic manner - mixing stout defence with steady accumulation - he teamed up with Buttler to help plunder 55 runs in the five-over powerplay. He brought up the second century of his ODI career with a six over mid-wicket - one of three maximums - as he seized the initiative for the hosts who went from 151-4 in the 35th over to 206-4 only 30 balls later. Earlier, he had read the situation perfectly when Alex Hales and Moeen Ali, the latter promoted to number three, perished playing attacking shots over mid-wicket and third man respectively. And when Cook, who twice edged between slip and gully on his way to 46 from 64 balls, and Eoin Morgan (14) were quickly dismissed to leave the score on 117-4 he recognised the need to counter-attack. Buttler will feel aggrieved to have been run out for a brisk 49 when going for a single having lost sight of the ball, but some impressive late hitting from Stokes propelled England, who had been inserted by India, to their highest score of the series. Inda's reply got off to the worst possible start when Edgbaston centurion Ajinkya Rahane slapped the fourth ball to Morgan at point to give James Anderson his first wicket of the series. The Lancashire paceman added his second soon after when he induced an outside edge from Virat Kohli and Cook took a smart catch at slip. When the belligerent Shikhar Dhawan was bowled by Moeen Ali for 31, India found themselves 49-3 and in danger of subsiding to a heavy defeat. The two new batsmen, Ambati Rayudu and Suresh Raina, were both dropped in the space of one Steven Finn over by Chris Woakes and Cook respectively, but wickets continued to tumble at a steady rate despite Rayudu registering his fourth ODI half century. Stokes removed Rayudu, Ravichandran Ashwin and Mohammed Shami, while Finn chipped in with two important wickets. The tall Middlesex paceman had India skipper Mahendra Dhoni caught at cover point by Stokes, before finishing off the innings when Jadeja played on having registered his best ODI score. 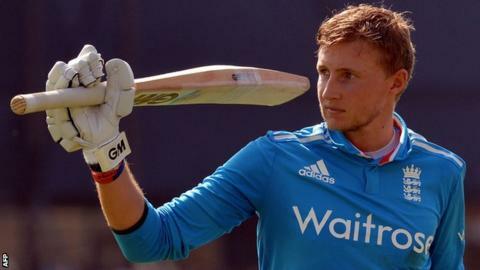 The two teams meet again in Sunday's Twenty20 international at Edgbaston, for which England will be without Tim Bresnan who has been ruled out with a shoulder injury.